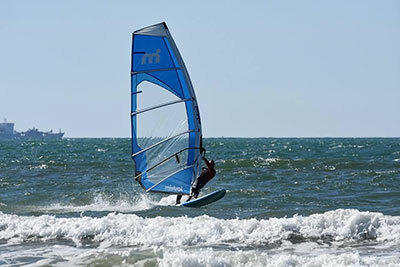 “I just had to try the new 2019 Mistral Windsurfing Equipment – even though the wind was not great. Those who were Kiting, were barely getting going, many drifting downwind or sideways. Selecting the 7.8m Mistral Zonda sail was the obvious choice, to which I attached the super light and well constructed Quikslide 100 litre model, the smallest of Mistral’s Fee Ride boards. The 7.8m is so light you cannot believe that it has this much square meterage. 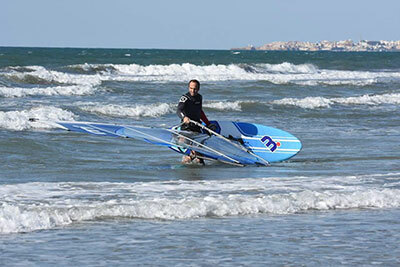 It had been some 20 years since my days of Windsurfing and enjoying wind and surf daily here in Israel. The excitement was building as I completed the rigging and the old feelings began to stir once again deep inside me, even before I stepped aboard. Taking the board to the water, the wind remained light and I was thinking I would need to pump hard to get up to planning speed, if I could remember how. I need not have worried, as even in the light breeze I was quickly up and planning – the board alive as was I, as old sensations flowed once again through my fingers and my feet, the rig pulling hard in my hands as the board skipped over the water. 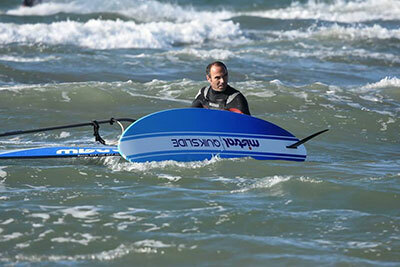 Many ask me who does Windsurfing appeal to? The answer to which, is that anyone can learn, but only the truly determined will rise to the challenge in mastering how to slide over water the Windsurfing way – and it’s more than worth the effort and the feeling of accomplishment never leaves you.